GIS users often use these three words when they approach Esri and ask about how they can manage assets located within an indoor space. The conversation typically starts like this: "Please help us improve our ability to find a space or an asset with a map and tell me the type, status, and condition... and by the way, can this information be updated in real time?" They may not realize that ArcGIS is a great mapping platform for real estate and workplace services (REWS) teams that need indoor map information in real-time or near real-time. The next comment from GIS users is usually along these lines: "Do you know how hard it is for us to quickly answer this simple question and see the results on a campus, building, or workplace map?" This conversation holds true for new clients as well as those that have used GIS for many years. Often, if the customer is already using GIS technology to manage location information about their outdoor property, infrastructure, and transportation assets, they will ask, "Why not store our indoor space and asset location data in a GIS as well? Why do buildings look like black holes in our geographic database?" There are a number of responses to this question, but the answer will circle back to the business requirements and current state of each user's system for managing maps and location-based information. 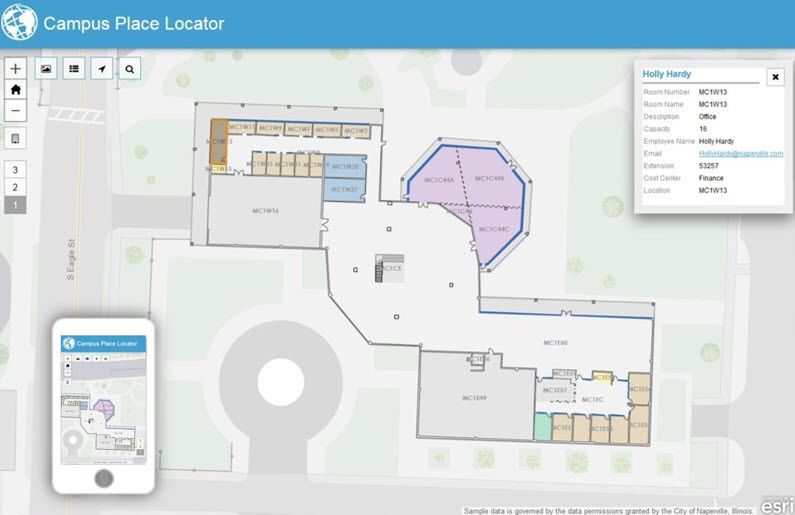 Why bring buildings, indoor spaces, and even your staff, into GIS? Because it improves operational efficiency, mitigates risk, and can make available spaces more profitable. But there are two more good reasons: improving staff productivity and performance. Visitors and customers can find meeting rooms and navigate through buildings more easily using a mapping app on a smart device. Maps also can be used to manage workspace. Employees can be placed next to the people they interact with the most to make collaboration more effective. They, too, can use navigable maps on their devices to find meeting rooms, other employee's offices, and resources more easily. This can be done using a common mapping hub or portal. When managing space today, it's all about the occupant experience—meaning we need to minimize distractions and reduce impacts on mental bandwidth—for visitors, customers, or employees in buildings. For the best possible experience, everyone can plan their visit before they even enter the building. Maps can help you locate employees' offices and quickly find their email addresses and telephone numbers. Enter the era of ArcGIS as a mapping platform for REWS, the professionals responsible for property sales, design evaluation and scenario planning, space management, smart building assets, amenity site selection, operations, and security . . . and that's just the short list. With ArcGIS, REWS professionals reap the benefits of quickly searching their portfolios with dynamic, map-based applications—applications that quickly return results at any scale, whether it's a map of offices around the world or a map of a single floor or room in a building. These same applications give users the ability to use 2D or 3D interactive routing and navigation maps on their devices. Core data and information models for campuses, buildings, and building interiors as well as travel networks. As-designed/As-built/As-managed data interoperability and enterprise business system integration workflows. All these models, workflows, templates, and tools allow customers to quickly implement ArcGIS into their property, workplace, or facility management business practice. The ArcGIS Online mapping hubs for facilities and real estate will provide you with more information about the ArcGIS platform and the wide range of examples, templates, and case studies. As for the black hole question? Many people are discovering that they don't have black holes in their data. It turns out many organizations are actively filling and managing those map gaps with indoor GIS data layers and fully integrating them with their outdoor GIS layers.